Known as a group as Dutch iris, the blue with yellow iris is most common although it can be found in whites and yellows. 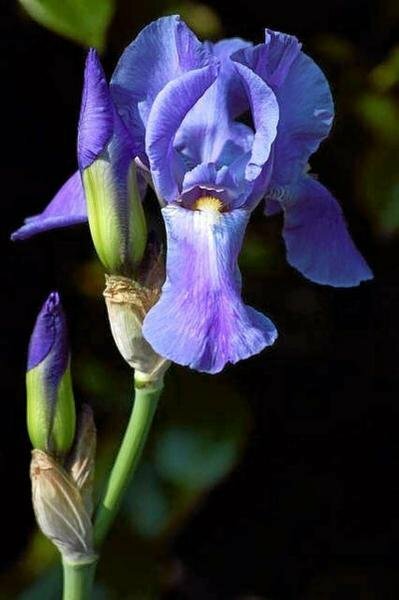 Iris varieties can also be bi-color, tri-color and bearded, which displays a bloom with frilly petals. The iris bulb will likely bloom in the spring to early summer from a previous late summer to fall planting and can bloom repeatedly for years thereafter. This bearded variety has crinkle-edged petals and several buds on one stem. When irises quit blooming heavily, they should be divided every 3-4 years, usually in the fall. 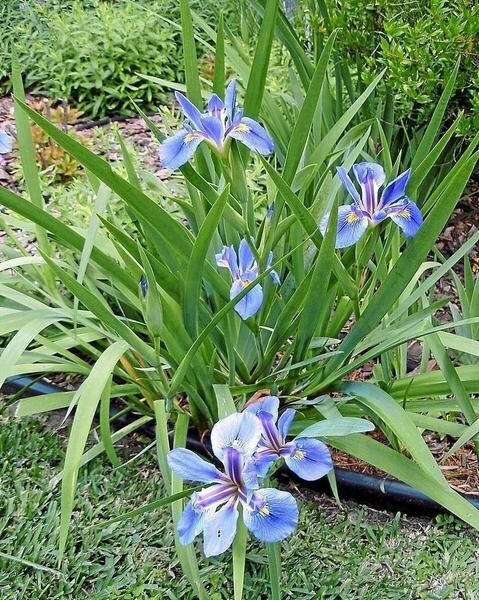 This bi-color iris will be dug up and split by using two gardening forks, cut with a knife if clumped, and re-planted in a space with full sun slightly shallower and 6 to 9 inches wider than its original location. The heirloom or cemetery iris is known to survive at old homesteads and cemeteries with relatively no attention and care. They have blue or white flowers that appear as early as February. 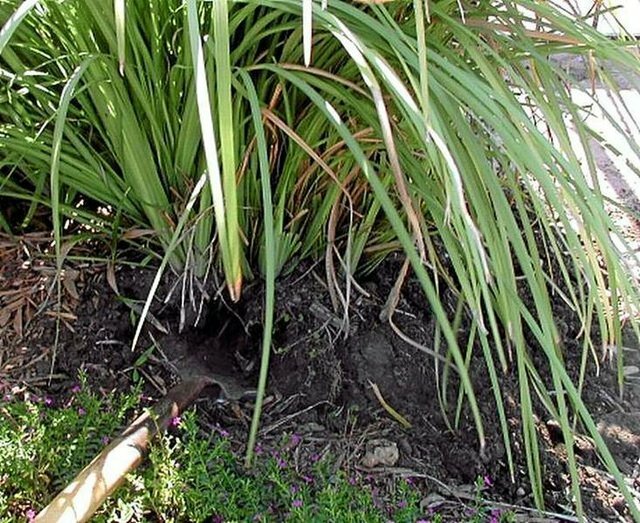 As a groundcover, the blades are shorter than other varieties and provide dense cover. Some people garden because they love the labor that goes with it while others just like to feel the dirt in their hands. I garden because I love the sight of a pretty yard filled with color. After looking at a sparse landscape all winter, I am thrilled with the first spring blooms that seem to appear magically but actually come from bulbs that were planted in previous seasons. As a lazy gardener, I love that the first hint of spring comes from work done in past seasons. The bulbs begin to come alive in early fall, foliage sets during the winter, and blooms appear in March or April. Sadly, many of the spring bulbs that we eye enviously in garden catalogs will not do well in Texas. However, there are plenty of choices that will. 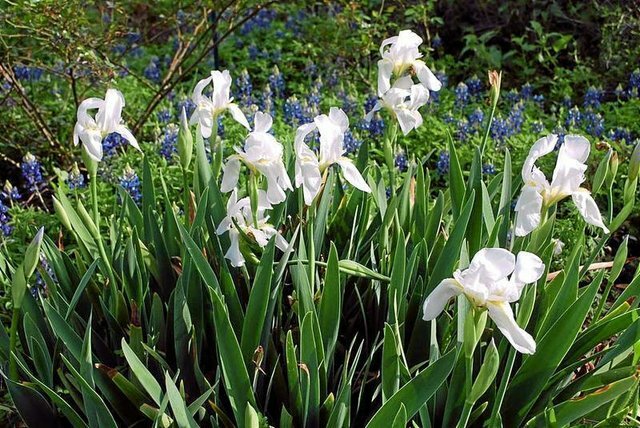 Some of those well-suited to Texas are blue Roman hyacinth, byzantine gladiolus, grand primo narcissus, Texas star jonquil, snowflakes and those that are commonly referred to as Dutch iris. Spring and Easter seem to summon their blooms, and this year is likely no exception. 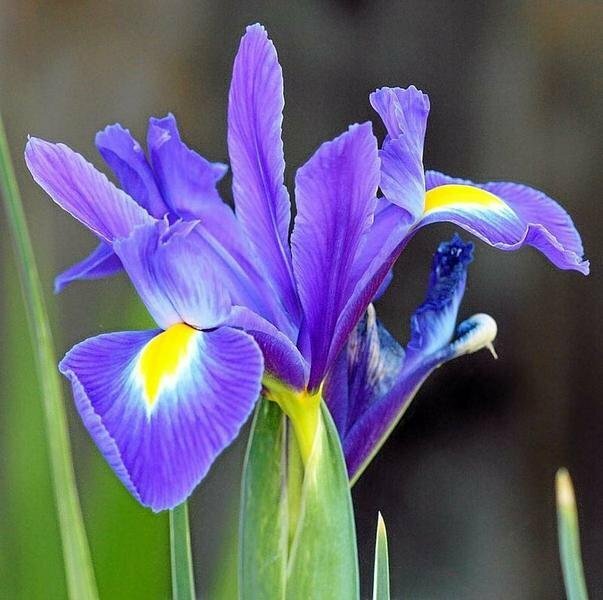 The Dutch iris was originally found in Spain in 1564 by a Belgium horticulturist. After he sent several strains to his Belgium friends, they began to hybridize them, and new varieties appeared. Grown in U.S. after World War II - Hundreds of years later, the growers developed an iris that was larger, broader and bloomed earlier. These were what we now know as Dutch iris. Not until after WWII were iris imported and grown in the U.S.
Two blue varieties for our area - There are now hundreds of varieties and colors. Two of the blue varieties worth trying in our area are imperator and Wedgwood, a popular choice of florists. Imperator blooms are a beautiful cerulean blue with bright yellow stamens. Wedgwood is also a sapphire blue. They produce long-lasting cut flowers. Like most bulbs, they like plenty of moisture and sun. The soil should be well-drained, however. They do most of their blooming in April, and like most spring blooming bulbs, they need to be planted in the fall. They naturalize easily and multiply rapidly. If they seem to stop blooming heavily after a few years, then they need to be dug up and divided. If you are not sure about the quality of the soil, it can be improved with peat moss, compost, ground bark or decomposed manure. Plant the bulbs at least 4 inches deep or more and at least 3 inches apart. One of the great characteristics of bulbs is that they can be planted between existing shrubs or perennials. Their slender, grass-like foliage takes up a minimum of space. They will bloom and give your garden color and as they begin to fade, perennials and shrubs will be taking their place for continuous garden bloom. You might want to plant bulbs at alternate intervals so you can enjoy them for longer periods. One of my favorite companion bulbs to plant with Dutch iris is the summer snowflake (Leucojum aestivum). Its white blossoms contrast with the blue blooms of the iris. In addition to the blue colors found in imperator and Wedgwood, there are many other colors available. Whatever choice you make, plant a dozen or more of the same color for a greater visual impact. I doubt that Wordsworth would have been inspired to write a poem about daffodils had he only encountered one or two . but a host of golden daffodils was inspiration for a poem and reason to plant bulbs in masses. After blooming, the bulbs go dormant. Let the foliage die back and leave the bulbs in the ground. Clumps will continue to multiply and bloom each spring for many years. Because the soil does not freeze in this area, Dutch iris do not have to be dug up each year nor do they need to be pre-chilled before planting. If you haven't tried Dutch iris yet, plan to add some to your garden next fall and be ready to sit back and enjoy the spectacular show next spring and Easter. The Gardeners' Dirt is written by members of the Victoria County Master Gardener Association, an educational outreach of Texas AgriLife Extension - Victoria County. Mail your questions in care of the Advocate, P.O. Box 1518, Victoria, TX 77901; or ﻿vcmga@vicad.com﻿, or comment on this column at ﻿The Victoria Advocate.